NATAL, Brazil – Biting opponents, racist comments – all that looked to be behind Luis Suarez, as soccer’s bad boy was maturing into a star for his club and country. Then, the old habit that most people leave behind in nursery school cropped up again in front of an audience of millions. Faced with a smothering and frustrating Italian defense in a must-win World Cup game Tuesday, the Uruguayan superstar responded with his front teeth. It came about the 80th minute when Suarez and Italian defender Giorgio Chiellini got tangled up in front of the Italy goal. The apparent chomp happened in an instant, but was caught by television cameras, it became a worldwide sensation and could lead to Suarez being kicked out of the World Cup. The referee didn’t see a bite, and no foul was called despite Chiellini pleading and pulling down his jersey to show a red mark on his shoulder. About a minute later, Uruguay scored the winning goal in a 1-0 game that sent Italy home. Uruguay will continue playing, but the federation that runs the World Cup will investigate and may suspend Suarez, who has twice before been disciplined for biting opponents in league games. FIFA officially announced an investigation late Tuesday, saying the Urguayans had until later today to present evidence. A ruling will be announced before Uruguay plays Colombia on Saturday. Suarez didn’t confirm or deny the bite, but said he was angry that Chiellini – one of the best defenders in the world and known for his physical play – had hit him in the eye during the game. Suarez, 27, should be celebrating a career year. After asking to be sold before the season, he stayed with Liverpool, won the scoring title and was named English Premier League’s player of the year. Now, he’ll have to try to start rehabbing his reputation again. Uruguay coach Oscar Tabarez and Suarez’s teammates immediately defended their star. “I want to say that if he’s attacked, as it has begun in this press conference, we’ll also defend him, because this is a football World Cup, not of cheap morality,” said Tabarez, who said he didn’t see a bite. Suarez was suspended following biting incidents in the Netherlands in 2010 and in England in 2013. He also was suspended for racially abusing an opponent. British tabloids have teasingly called him a vampire, and social media artists have had fun manipulating his photo into images of Dracula and Hannibal Lecter. And he was responsible for one of the most talked-about moments of the 2010 World Cup, when he purposefully used his hand to prevent a Ghana goal near the end of the quarterfinals. Suarez received a red card and was banned for the next game, but Ghana missed the penalty kick and was eliminated. 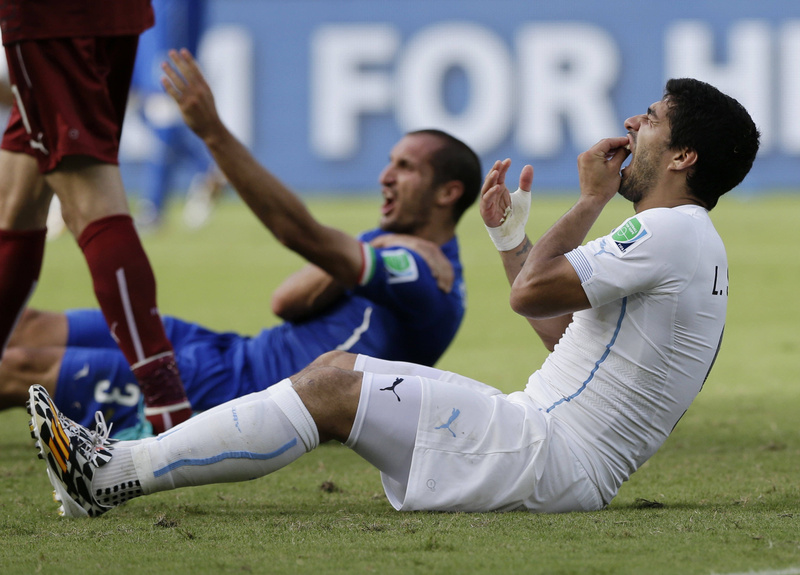 Uruguay defender and team captain Diego Lugano suggested Suarez was a victim of his past. After taking off his jersey, Suarez walked to a corner of the stadium, clapped and flashed his toothy smile as he waved to the thousands of Uruguay fans chanting and cheering his name. FIFA, soccer’s world governing body, can sanction players with bans of at least two matches and up to a maximum of 24 months. FIFA vice president Jim Boyle said on British television that Suarez had let himself down again. Chiellini said Suarez should have been kicked out of the game.